Dr. Rachel McKinnon: Hi JayCee. Thank you for taking this time to speak with me. 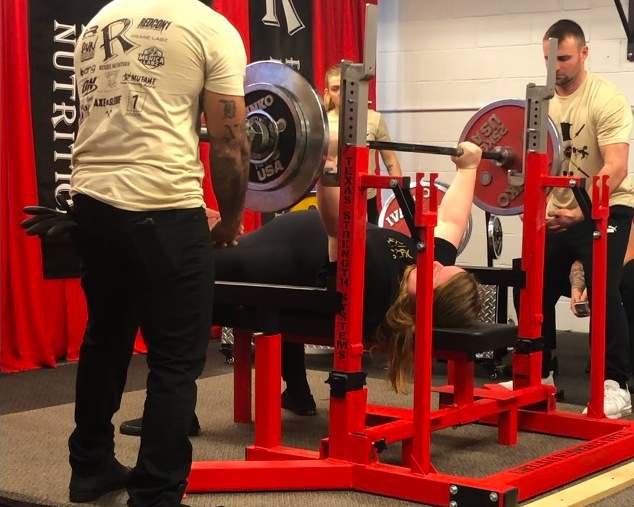 First, congratulations on your recent State Championship win in the Raw Open and in the Raw Bench events, and setting the USPA (US Powerlifting Association) Minnesota record in the bench! Can you tell me about the competition? JayCee Cooper: The competition was in Mankato (MN), which is in southern central Minnesota. It was a little intimidating. Mankato is a smaller city and going down there to a place I’ve never competed at before and trying out a completely new federation, not knowing what it was like. It was super interesting. For the most part, people were really welcoming though. When I got there, and I had not seen the flights or the schedule yet, so I was playing catch-up to begin with. My coach, JVB, got there and got me set straight. We went to the rules meeting and noted the differences and were good to go. There were four flights I think, maybe 3. I really just put on my headphones and let JVB get things ready and figure out things with the warmups. I just tried to ignore the extra noise that was going around. There were a couple (transphobic) incidents but for the most part I just put my head down, got my warm-ups in. I went 9 for 9 (made all 9 planned lifts) with all white lights (the judges all agreed that each lift was successful). And it was just a really good day. Everything went to plan—exceeded the plan. It felt like I could have lifted a bit more, but it all worked out. I was happy with it. RM: Let’s talk about results. What were your lifts? JC: This is kind of embarrassing. *laughs* But I’m not entirely certain at the moment. Let’s see, I think I got just short of 300lbs in the squat, 215lbs-ish for the bench press, and around 350lbs for the deadlift. Something like that. And that was enough on that day to take it home. So it’s great. RM: Gotcha. So when did you start powerlifting? JC: Well I didn’t really start competing in powerlifting until about a year ago. But I’ve been lifting on and off for other sports, and doing powerlifting, for I don’t know, a while. You know, growing up, all the kids the first lift we learned was the bench. So more or less it’s always kind of been around. But competing and taking it seriously, honestly it’s only been a year, if that. I came to it because I had an injury playing roller derby and once my physical therapist was like, you’re free to do more rigorous physical activity, I just gravitated towards it because the Women’s Strength Coalition influence on me with their Pull for Pride event. And it kind of just went from there and got more and more involved, and wanted to compete. RM: Cool. What’s your typical training week look like? JC: I train four days-a-week, usually Monday, Tuesday, Thursday and Friday, or Tuesday, Wednesday, Friday, and Saturday. Usually it involves a 3hr session in the gym doing squat, deadlift, and bench and accessories. I don’t do much cardio. I just want to lift as heavy as I can. RM: Let’s get personal: what are your PB’s and what weight class do you compete in? JC: Sure, so to start, I’m a superheavyweight. So that’s 90kg+ in USPA and 84kg+ in USAPL/IPF. Squat: 300lbs, Bench: 220lbs, Deadlift: 375lbs. I did break my ankle last November, and these were numbers prior to breaking my ankle or really deciding to compete. JC: Yeah, I broke it playing roller derby, which is the sport I was coming from. RM: I think I’ve had about 12 sprained ankles at this point and broke my first bones this past summer. So that was fun (sarcasm). I crashed right after winning. JC: Going from being super active to being completely immobilized is never fun and totally messes with your brain and mental health. RM: For sure. I often get into depression pretty quickly when I’m injured. 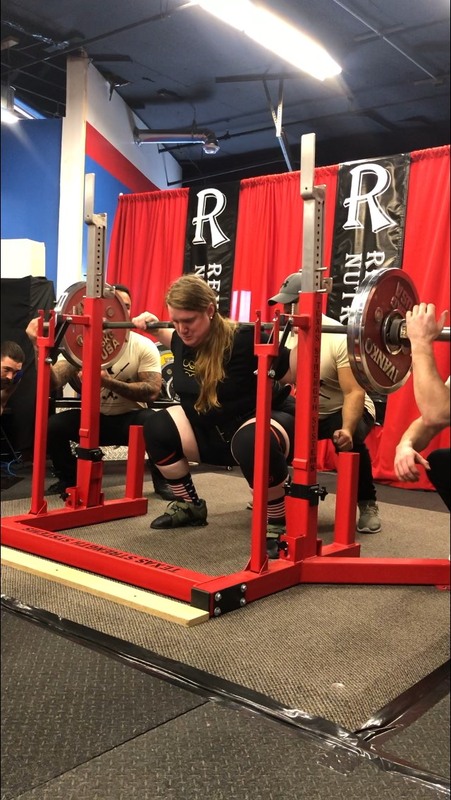 RM: So what’s it like being one of the very few trans women powerlifters? JC: It’s been kind of lonely to be honest. 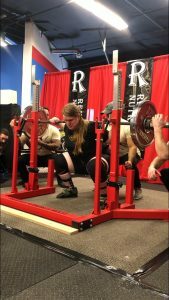 There aren’t a ton of transfeminine powerlifters. There are a few I’ve met through the internet. Thankfully the internet exists, because it brings people together like that. But otherwise it’s kind of lonely to be perfectly honest. You don’t have a lot of shared experiences with people, and we’re not very well represented. I mean, Janae (Kroc) has started talking publicly, she is amazing and such a great person. I had the opportunity to meet her this last fall. But really in strength sports we’re not very well represented. So it feels isolated and lonely at times. It feels like you’re the only one out there. Which is obviously not the case, as you see through events like Pull for Pride and the Women’s Strength Coalition. Trans people are coming out and competing in that—it’s a non-sanctioned charity event and it brings people together. But in competitive powerlifting, there aren’t many of us. RM: Yeah, I totally get that. We started a trans-focused cycling team (Foxy Moxy) to fit that need to build that community. Because that was a thing that didn’t really exist. JC: So there’s a little bit of a movement that’s going on with that in lifting. There’s a program in New York that’s called Queer Trans Strength NYC. I think it’s held at the Murder of Crows Barbell Club. It’s a group of trans and queer lifters who get together. And there’s Radically Fit in Oakland, and what they’re doing is incredible, Ilya from Decolonizing Fitness, and Maria with Fear Her Fight Athletics too. Women’s Strength Coalition is opening a new gym in NYC called Strength for All! Things are happening and all of it makes me feel really hopeful! RM: Awesome, I’ll look them up! 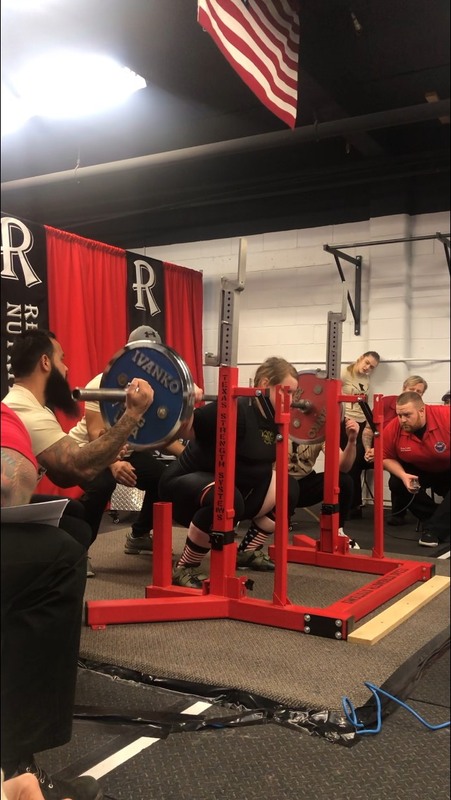 What have been some of the struggles and barriers you’ve faced in being a competitive powerlifter? JC: Oh gosh, where do I even begin? When I started it was super intimidating. If you Google ‘transgender powerlifting,’ the results and comments you’re going to see aren’t very encouraging, I guess you can say. So that I even came to this sport and decided to go for it, is, I don’t know, ‘How did I get here?’ to be honest. But the sport itself is great and it’s so empowering that I’d love to see more trans lifters be a part of the sport. But back to your question, some barriers have been that USA Powerlifting (USAPL) will not allow trans women to compete in their federation. There’s no actual rule that you can look up that will say this though. RM: Yeah, we’ll come back to that. I’ve got that question coming up. JC: Yeah, so there are some federations that don’t even let trans women compete. So that’s a barrier. And in strength sports in general people have these preconceived notions of trans women and as such the support and resources just aren’t there. There are a few amazing people and organizations that are trying to do work on behalf of trans people, and people of color, and trying to break barriers though. It doesn’t help that it’s a sport that’s seen as hyper-masculine and toxic, because of that it’s off-putting for so many people. But as I’ve found, there’s definitely community to be found within the powerlifting world. It’s just that you have to look and try to find it. RM: What has the reaction been like from other competitors? You’ve told me some issues of passive-aggressiveness. Have there been any issues of harassment? JC: Sure. A lot of the stuff is at a microaggressive level. But some of it’s really not. When I was at State, there was a lifter who looked me straight in the eye, walked over, and slammed a coke can down on the table in front of me slightly crushing it, trying to intimidate me or something. RM: Woah! I don’t think that’s microaggressive, that sounds pretty aggressive aggressive! JC: Yeah, that’s what I’m saying. Sometimes it’s just aggressive. Or for instance, I’ll be walking by and people will be having noticeably loud conversations about trans people being allowed to compete and “There goes all the records!” and “It’s unfair!” and “What would you do if you saw a trans person competing?” Luckily I haven’t had any face-to-face confrontations and this last time the officials were really welcoming. The USPA reps were fantastic and made sure that I was okay. There’s just not a lot of precedent for trans people in our sport so I think a lot of people, in ignorance and fear, are trying to figure out what is even going on. RM: Have any of those conversations that you’ve overheard, do you think those people knew you were there and that you’re trans? JC: Oh sure. Maybe some of it. I’m sure some of it was maybe happenstance. But some of the times I can’t help but think that, wow, that’s purposefully loud enough for me to hear. And that’s an active form of intimidation and transphobia. He said this extremely transphobic to me, about me, but didn’t realize that it was me. It was this bizarre thing where people say transphobic things around me, about me, but don’t realize that they’re referring to me because most people don’t know I’m trans from looking at me. So I wonder if maybe some of that is going on in the conversations you’re hearing? JC: Yeesh. I don’t know. Most of the transphobia I experience tends to be pretty direct. Maybe that’s because some people just assume that I’m trans at first look. But yeah, that could definitely been the case. It’s just gross. People need to see that trans athletes are human beings. We’re nothing to be afraid of. We’re just people, you know? I’m sorry you had to go through that. That’s terrible. RM: Oh he got in trouble right away. I thought it was kind of funny, actually. The look on his face was priceless when I called him on it. JC: Yeah, that’s a really important thing, too. A lot of the time, the things these people are saying aren’t about us. It’s about their own ignorance. So it’s good that you were able to laugh that off and go and compete. I try as best as I can to remember that it isn’t because of me that they’re mad, it’s just their ignorance. It’s them. RM: Right on. So you won in the USPA state championship. How has USPA treated you as a trans athlete? The state chair was super nice and said that they were happy that I was there and that I had every right to be there. One of the officials after the competition was also really supportive and told me how great of an athlete they thought I am, and how proud they were that I was able to take home a win. RM: That sounds better than just ‘okay’ to me! JC: Definitely. Like I said, I haven’t been in competing in the USPA for very long. I’m hoping that it continues this trajectory of kindness and support. RM: The USPA isn’t part of the International Powerlifting Federation (IPF), but the USAPL (USA Powerlifting) is. What about competing in the USAPL? JC: It’s a whole different thing. The USAPL will not allow me to compete because I am a transfeminine person. And according to them it confers some sort of anatomical advantage, even though I’m not sure where they’re getting that ‘science.’ That hasn’t been provided to me. It’s just been told to me over email. USAPL is probably the more prominent federation in the US. It’s attached to the IPF, the international federation, and the World Games. So there are more opportunities to compete, especially in MN. But it turns out they’re very exclusive in who they’ll allow to compete. I don’t have a lot of experience with USAPL because of that, and have had to compete in unsanctioned events prior to coming to the USPA because of that. So my experience with them hasn’t been so great. RM: The USAPL falls under the auspices of the IPF, and the USAPL constitution notes that it adheres to all IPF regulations. The IPF has explicitly adopted the IOC (International Olympic Committee) policy on transgender athletes. And the Canadian Powerlifting Union, another member of the IPF, explicitly accepts trans women lifters. The IOC policy says that trans women must be able to demonstrate at least 12 months of continuous endogenous testosterone values below 10nmol/L, and that they’ve declared that they have a female gender identity. Have you done that? JC: Absolutely, yeah. I wanted to make sure that when I was going to be competing in the USAPL, I was going to do it the correct way. I knew from being an elite athlete in another sport that I would need to get a TUE for one of my hormone replacement therapy drugs. It’s an anti-androgen, spironolactone, which lowers my testosterone. It certainly doesn’t give me an advantage: it takes away testosterone, which is, you know, pretty useful in building strength. RM: This is a story for another time, but a lot of my research is on how unclear the relationship between natural endogenous testosterone and performance is. There is no relationship at all in men: men with 5x more testosterone than other men are no bigger, stronger, faster on average. In fact, there are a disproportionately large number of elite men athletes who fall within the female range of testosterone. It’s wild. And there appears to be no reliable effect in women, either. But you would need a TUE for spironolactone, though, because in powerlifing it can be abused as a diuretic, and in other World Anti-Doping Agency sports it can be used as a masking agent for other banned substances. But I’ve never heard of a trans woman being denied a TUE for spiro before. In fact, WADA has a policy document on granting a TUE for spironolactone to trans women athletes. RM: So they didn’t exactly deny your TUE: they just outright said that you can’t compete in the USAPL because you’re a trans woman. And they just stated that it’s due to trans women having an unfair competitive advantage without providing any proof. JC: Right. They just flat-out exclude trans women and transfeminine people even if they meet the IOC policy requirements adopted by the IPF. RM: Given that you’re following the IOC policy, and that the IPF has adopted the IOC policy, and the USAPL has to abide by the IPF policies, what’s the problem for the USAPL? I basically followed the guidelines to a ‘t’ is what I’m getting at. And that’s what’s said in the IPF by-laws. So it doesn’t seem the USAPL is following their own guidelines to abide by IPF policies. They’re just being exclusive. RM: Seems like it. And they haven’t given you any evidence to substantiate their claim that there is an inherent unfair competitive advantage for trans women athletes, have they? No they have not. The chair of the TUE committee told me that I couldn’t compete because of pubertal exposure to testosterone. But no, I haven’t been given anything else other than that. I reached out to the IPF and was able to speak to the President and Secretary General, and they both told me that eligibility was up to the individual national governing body. Which I thought was interesting given that the IPF adopted the IOC policy. And if you look at the Canadian Powerlifting Union, they have a policy that includes trans women as able to compete. It kind of makes it seem like the USAPL is just excluding trans women because they want to. RM: I like the way you put that. So what do you wish the USAPL and other sports federations knew about trans athletes? JC: I think that there needs to be a major reframing about how we talk about trans athletes. And I talk a little bit about this on my Instagram post about my win. People who oppose trans athletes in sport talk about the ‘advantages’ that trans athletes supposedly have, but I don’t think that people are taking a moment to stop and think about how many advantages cisgender, heterosexual, and white people are given in society and navigating sports in general. And in the face of that there are these trans athletes who are doing these amazing things. I honestly think that should be something that shouldn’t be feared and should be celebrated. I really wish people would take that to heart. Any advantage we may have, if any exists, is nothing in compared to the transphobia, transmisogyny, and societal discrimination that we face on a daily basis. It’s nothing. RM: Well put. What support do you hope to see from allies in the powerlifting communities, and society more generally? JC: I’d love to see people speak out. I think there have been a lot of people afraid to speak out because of the strict rules and governance structure with USAPL and sports organizations in general. I think taking risks and speaking out are necessary if we’re ever going to move forward. So I’d love to see people putting something on the line. I saw a gym put out a letter today in support of trans athletes competing in USAPL and saying as a gym that they’re demanding USAPL change their policies to allow trans women to compete, and to follow the IOC guidelines. I think that’s one example about how allyship and action can show up. RM: What’s next for you? What are your 2019 goals? JC: Well first I’m moving. So I should probably pack and figure that out. Then I’ll regear and see what meets are coming up this summer and work towards qualifying for nationals at some point. There’s also a bunch of fantastic conferences and events happening over the summer, and I’d really like to be present at those and have my voice be heard a bit more, and to share my experiences. So I’m looking forward to that. RM: Awesome. Good luck! Thank you so much for taking this time to sit down and share your story with us.